Are you allergic to peanuts and/or tree nuts? I have a tasty snack to introduce to you, it’s MadeGood Foods snacks. Their healthy, delicious granola bars, clusters and rice treats are made in a dedicated facility free from the eight common allergens: peanuts, tree nuts, wheat, dairy, egg, soy, sesame. fish and shellfish. For this reason, MadeGood snacks are organic, gluten-free and non-GMO project verified. This makes for the perfect allergy friendly snack for mom (and family)! I received 3 boxes to review. What makes these the perfect gift? You can do a DIY basket with this allergy friendly snack, a shemug, some coffee or tea and a good book. In 2016 I went out to eat with my family, we really enjoyed the food at the restaurant we’ve never been to, but being a blogger and a product reviewer, I received coupons for free food for my family and I. Sounds good right? NOPE! About an hour after we left the restaurant and on a Mardi Gras Parade route, the parade was just about to us, I started having a reaction to something. It was hard for me to breathe and my face was swollen up that people thought I was beaten up! I couldn’t even walk due to my blood pressure dropped so low and that gave the impression that I was drunk! I was with my granddaughter and family, so rest assured I was NOT drunk, I had tea with dinner. I was rushed to the hospital by the EMT’s and was told by the DR I was allergic to something I ate, but what? I still have NO clue, and it’s never happened since. Anyway, I know it’s not nuts, but put yourself in that situation, what would you do? I started looking for healthier options for eating and sticking with restaurants I know! I recently discovered an amazing brand MadeGood Foods. Their snacks are made with wholesome organic ingredients and is allergy friendly . They are also low in sugar and calories while also having one full serving of hidden veggies (sourced from spinach, broccoli, carrots, tomatoes, beets, shiitake mushroom) in each bar or mini pouch. These are perfect for packing into a lunch or for an on-the-go snack. Granola Bars come in four delicious flavors – chocolate chip, mixed berry, chocolate banana and apple cinnamon – perfect for the afternoon pick-me-up whether at school, work, or on the go. 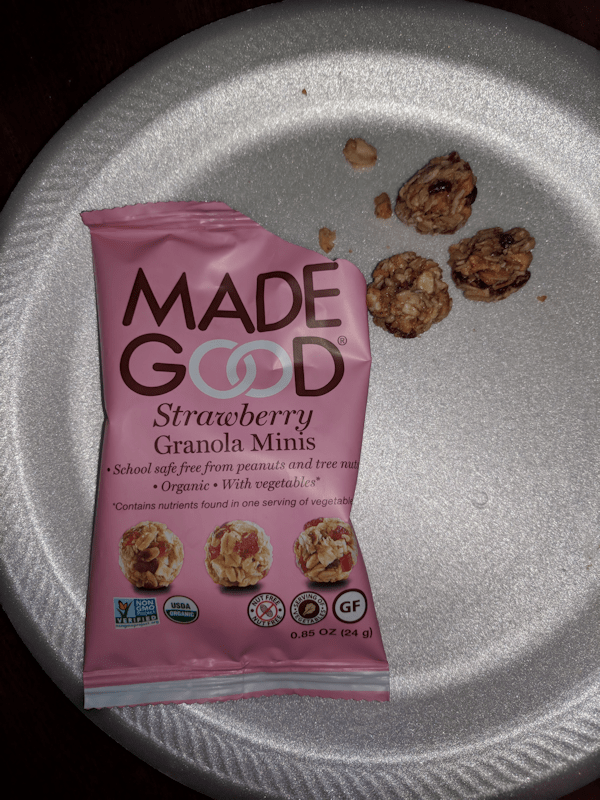 Granola Minis are round clusters portion packed for an on-the-go snack available in mixed berry, strawberry, apple cinnamon, chocolate chip and chocolate banana flavors. Given the snackability, they’re great for parties—just fill a bowl! I received the strawberry flavor and they taste great! It has just enough strawberry flavor to make you want more. Crispy Squares are reminiscent of everyone’s favorite childhood snack… rice crispy treats! MadeGood squares are healthier than the traditional version because they contain the nutrients of one serving of vegetables in each square. OMG! When I opened the package I could smell the vanilla and they test better than a rice crispy treat! I asked for the vanilla crisps because I know my husband likes rice crispy treats and I want him to enjoy these too. To learn more and explore the product line head over here. You can purchase these delicious bars online at Amazon, Walmart and Lucky Vitamin. Or check the store locator to find a store near you.